What Kind of Spider Has Yellow & Red on It? With over 37,000 different species, spiders are some of the most prevalent insects on earth. Many of these species blend in seamlessly with the environment. The majority of spiders are black, brown, gray or some combination of neutral colors. However, a few distinct species stand out from the neutral crowd. These colorful arachnids can be orb-weaving or color-changing, and are adorned with varying hues of yellow and red. The red widow (Latrodectus bishopi) has a reddish-orange head and body, and an abdomen adorned with red spots surrounded by yellow rings. Red widows are found primarily in Florida, preferring to spin their webs in palmetto scrubs, rosemary bushes, scrub oak and other lower shrubs around 3 to 10 feet above the ground. This spider is highly venomous. A female red widow can inflict neurotoxin capable of inducing sustained, maybe even permanent, muscle spasms in humans; males and juveniles, on the other hand, do not bite. Goldenrod crab spiders (Misumena vatia) are predominately yellow spiders with two red streaks on their abdomens. A goldenrod’s diet and environment can affect its overall body color, which ranges from white and pale green to butter yellow and bright yellow. These spiders always live near flowers, herbs and shrubs, where they feed on varying types of pollinators, like bees, flies and butterflies. They have the ability to change colors and camouflage themselves among flowers while they wait for prey. A goldenrod crab spider’s bite is not harmful to humans. 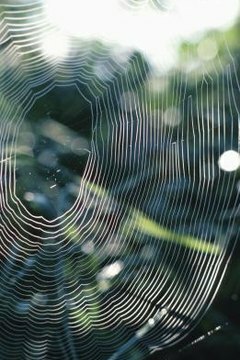 Unlike most other spiders, orb weavers spin very precise webs that resemble circular grids. They also have a couple more eyes than many other arachnid species; orb weavers possess 8 individual eyes. Some species in this group, like the arrowhead spider (Verrucosa arenata), marbled spider (Araneus marmoreus), and black and yellow garden spider (Argiope aurantia) have bodies dotted and swathed in reds and yellows. The woodlouse spider (Dysdera crocata) is found throughout North America, England, northern Europe and Australia, where its main diet consists of pill bugs and sow bugs. These spiders have reddish-orange bodies and legs, with grey, creamy white or dingy yellow abdomens. A woodlouse spider bite, though painful and itchy, is not acutely dangerous to humans. What Type of Spider Has Brown Bands on Its Legs? What Does a Happy Face Spider Eat?